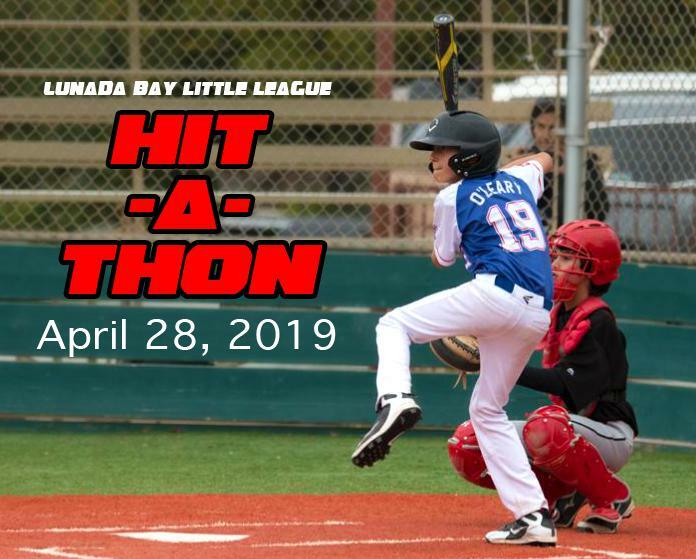 LBLL is proud to host its third annual Hit-A-Thon event, which provides a chance for our players to showcase the hitting skills they have developed over the season while raising critical funds to support the league at the same time. Each player will get six swings and the hits will be scored, with the point totals then generating money based on the amounts pledged. If every player raises just $50, this will be a $10,000 fundraiser for our league! This helps us pay for all the things big and small that allow game day to happen, such as uniforms, equipment, umpires, utilities, field maintenance, etc., etc., etc. Please give generously and come out on April 28 to cheer on our players! Download the 2019 Hit-A-Thon Form HERE! Each team will have a fifteen-minute slot. Players should be in uniform to represent your team! Please be prompt – we will run fast and run on time! See separate slot schedule. o Sixth pitch / swing is a 2x bonus ball. Similar scoring structure but appropriately reduced and scaled dimensions for Minor, Farm, and T-ball participants. And of course flat pledges in honor of participation are always appreciated! Each player should gather pledges on the attached pledge sheet prior to the Hit-A-Thon. official (likely the team manager) can record the scores as the player hits. manager by May 6, 2019. Managers to turn scores and money in to League Treasurer by May 10, 2019. ©2019 Lunada Bay Little League / SportsEngine. All Rights Reserved.